Author(s): Nathalie Chopin, Xavier Guillory, Pierre Weiss, Jean Le Bideau, Sylvia Colliec-Jouault. IFREMER Institut Francais de Recherche pour l’Exploitation de la Mer, Laboratoire de Biotechnologie et Molecules Marines, Rue de l’ile d’Yeu, BP 21105, 44311, Nantes Cedex 03, France. Polysaccharides are among the most abundant macromolecules on Earth. These polymers are easily obtained from various marine resources such as algae, microorganisms and crustacean shells. The structure of these natural carbohydrates is innovative and quite complex. Marine biopolymers represent key scaffolds toward large challenging fields, such as biomedical applications (glycosaminoglycans, regenerative medicine and drug delivery) and tailored biomaterials. Chemical modifications can be applied to modify their final properties in a specific purpose. New functional glycans are achievable and represent a real potential with their intrinsic biocompatibility and biodegradability. Hydroxyl groups are ubiquitous in polysaccharides structure and involved in most of the chemical modifications. The most useful functionalities are ester, ether, amide, amine and alkyl groups. The starting materials could be a natural or depolymerized polymers and the reaction considered with a regioselective point of view. In this review, we will focus on chitin polysaccharide, which is extracted according to industrial processing from exoskeleton of several marine crustaceans. A subsequent deacylation provides chitosan. 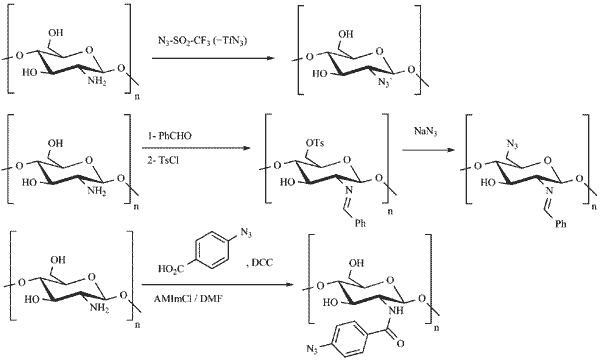 This marine polysaccharide is very similar to cellulose, a widespread fiber plant organic polymer, except for an amine group on the C2 position instead of a hydroxyl group. Furthermore, seaweeds provide the most abundant sources of polysaccharides: alginates, agar/agarose, carrageenans and fucoidans. In order to improve the original physicochemical and biochemical properties, we will highlight the chemical modifications involving the listed marine polysaccharides of interest. Keywords: Alginates, carrageenans, chemical modification, chitin, chitosan, grafting, marine polysaccharide, polymer. Affiliation:IFREMER Institut Francais de Recherche pour l’Exploitation de la Mer, Laboratoire de Biotechnologie et Molecules Marines, Rue de l’ile d’Yeu, BP 21105, 44311, Nantes Cedex 03, France. Keywords:Alginates, carrageenans, chemical modification, chitin, chitosan, grafting, marine polysaccharide, polymer. Abstract:Polysaccharides are among the most abundant macromolecules on Earth. These polymers are easily obtained from various marine resources such as algae, microorganisms and crustacean shells. The structure of these natural carbohydrates is innovative and quite complex. Marine biopolymers represent key scaffolds toward large challenging fields, such as biomedical applications (glycosaminoglycans, regenerative medicine and drug delivery) and tailored biomaterials. Chemical modifications can be applied to modify their final properties in a specific purpose. New functional glycans are achievable and represent a real potential with their intrinsic biocompatibility and biodegradability.